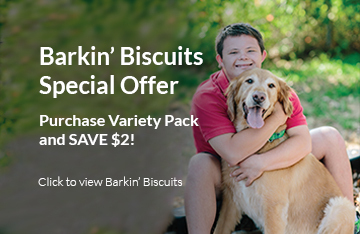 Barkin’ Biscuits, launched in July of 2014, is a culinary micro-enterprise and vocational training program for young adults with intellectual and developmental differences in the North Florida School of Special Education Transition and Post-Graduate programs. It is also a nationwide supplier of all-natural tasty dog treats that your canine will love! Watch this video from News4Jax to see the making of these all-natural dog treats. Barkin’ Biscuits are all-natural dog treats that come in a variety of flavors and incorporate fresh ingredients from Berry Good Farms including wheatgrass, sweet potato, carrot, moringa and rosemary. Using fresh vegetables and herbs from the garden means students involved in our horticulture training program also have a hand in creating Barkin’ Biscutis. It’s a fully integrated operation of which our students are the heart and soul. The chefs who lovingly create these all-natural dog treats for our furry friends around Northeast Florida learn to follow recipes, mix ingredients, roll and cut the dough, bake the treats, weigh and package for retail market and prepare custom orders. At Barkin’ Biscuits, our chefs learn the importance of intentional preparation on a job site, the value of hard work and the task of problem solving when things don’t go to plan. Each of the students participating in the program possesses a different skillset that they are able to hone and apply to their role at Barkin’ Biscuits. We celebrate in the qualities that set each of our chefs apart, and recognize that success is achieved when we draw upon each other’s strengths.